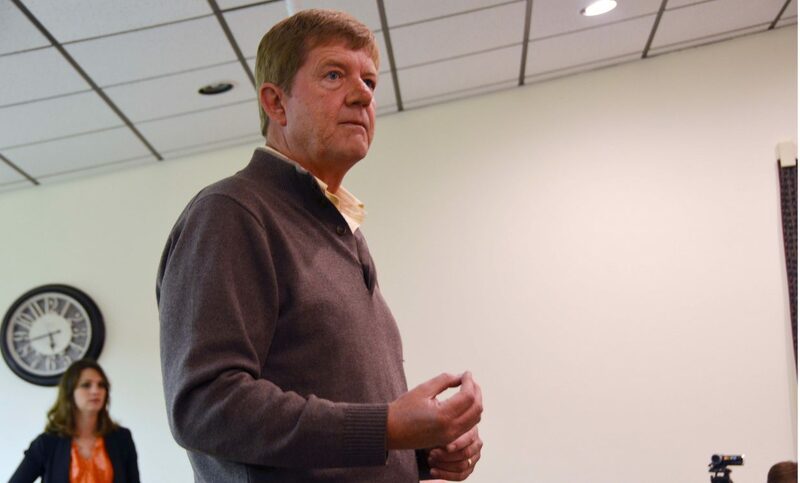 U.S. Rep. Scott Tipton, R-Colo., speaks about his congressional plans Monday night at Craig City Hall. Craig — U.S. Rep. Scott Tipton, R-Colo., made his way through the Yampa Valley on Monday as part of his Colorado tour to learn more about issues facing the state and to share his congressional plans. Tipton stopped in Steamboat Springs on Monday to discuss small business with F.M. Light & Sons and later hosted a town hall meeting in Craig. At the Craig event, he focused primarily on water rights, greater sage grouse issues, the Affordable Care Act and the energy industry. He said that the federal government hands down too many restrictions on public and private lands. “We’ve got an out-of-control regulatory environment,” Tipton said. It’s important for Western states to speak up because leaders in the east don’t fully comprehend the issues of water rights or what and endangered species listing can do to public and private land use, he said. Tom Mikesell, a Moffat County resident, posed a question about the sage grouse issue. “The biggest problem with our diminishing population of the sage grouse is the predation,” he said. Tipton agreed that predators ought to be considered as part of the whole picture when it comes to listing species. “We’ve introduced predators so now we have endangered species eating endangered species,” he said. Many residents were concerned about water usage and rights. “The headwaters of the Yampa need to be storing water right now,” Moffat County resident Dean Gent said. Other people shared their concern that the Environmental Protection Agency or other regulatory agencies would prevent them from storing water. Water in Colorado is private property and should be treated by the federal government as such, Tipton said. “This is a private property right that we got to be able to protect,” he said. Before wrapping up, Tipton made sure to reiterate his position against the Affordable Care Act. Tipton spent Tuesday chatting with Craig Rotary, going over local issues with the Moffat County commissioners and discussing small business concerns with the Craig Chamber of Commerce. He will continue on his Colorado tour until he heads back to Washington, D.C., during the weekend.